Working in the garden can be a tough job, specially in summer, when the sun is relentless and suffering from heat stroke is a very real possibility. Luckily, there are quite a few products available that can alleviate the burden of the responsibilities of garden upkeep. Tools, personal protection equipment, and watering systems are just a few of these. However, one of the most important ingredients to promote a green and healthy lawn will always be a good helping of the finest fertilizer. Fertilizers are products that can be either organic or synthetic, and will provide valuable nourishment to both the plants and the soil they are planted in. Fertilizers are created to make short work of maintaining a garden, allowing your shrubs to grow strong and healthy, even in the most adverse of weather conditions. The main drawback of these products is that they are usually not safe for pets and children. Consequently, most manufacturers suggest keeping them safely sheltered inside the house when applying fertilizers, until the product is absorbed by the soil. For liquid fertilizers, you might have to wait until it dries, which can take a few hours depending on the weather. But in the case of powders and granules, you will have to wait until it rains in order for the fertilizer to be properly soaked into the soil. The Andersons is a company with a long and successful history in the agricultural industry. Starting as a grain transport company in the 40’s, this organization has grown through the years, and is currently one of the biggest groups of its kind. They currently have 5 divisions; grains, plant nutrients, ethanol, rail, and retail. The PetSaf 5M LWN fertilizer is produced by the plant nutrients group for the sole purpose of providing an alternative to toxic fertilizers. It’s formula enriches your lawn with enough NPK to promote a thick, green turf, while also boasting a speedy absorption through the soil. Your lawn will be safe for pets right after the first watering, so you can feel free to let them run around, like dogs and cats are wont to do. Azomite Mineral Products, Inc. has made a trade out of producing some of the world’s finest fertilizers. The ores these products are enriched with are mined from ancient mineral deposits in Utah. These ores contain more than 70 trace minerals that can be used as soil amenders and plant feed, with amazing results. This organic fertilizer contains the aforementioned Azomite, along with other organic materials, which makes it very effective as plant food, and also very pet-friendly. Plants that are treated with this product grow faster and stronger, even blooming as soon as 3 week earlier than other plants treated with regular fertilizer. Summer can be a challenging period for gardening. Only the most daring gardeners see this season as an opportunity. The scorching sun, coupled with the increased humidity in the air can create a unique environment, which may allow the growing of tropical plants in places where this is usually complicated or impossible. 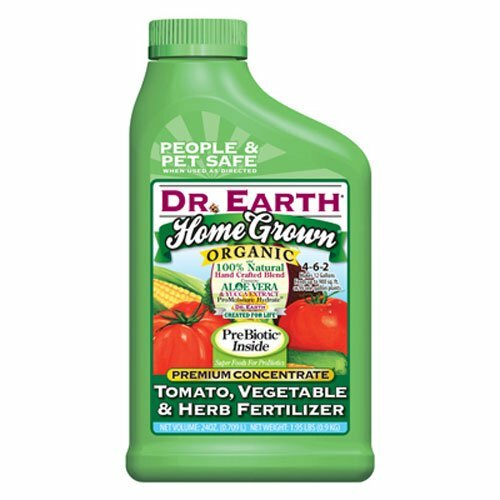 Dr. Earth is a company widely known for its support of organic products, trading mainly in such natural fertilizers. This one in particular is used to promote the growth of tropical plants in a greenhouse or natural environment, so that you may grow palm trees and hibiscus, among many others. This fertilizer is completely organic and safe for pets. The fast acting ingredients, coupled with the slow release mechanism, ensure that your plants remain fed for up to 8 weeks with a single use. When it comes to organic fertilizers, Dr. Earth produces such high-quality products that it definitely deserves another spot in this list. This time around, this company brings us a fertilizer that is specially created to be used on vegetable plants. Its special formula was designed with prebiotics, and other beneficial groups of microbes that will benefit the plant’s natural absorption and growth, in mind. This product is water soluble and meant to be mixed inside your watering can. It is easily applied by watering your plants as you normally would. 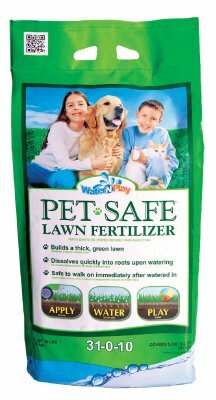 Its organic nature makes it one the best lawn fertilizers, safe for dogs, cats, and other pets. 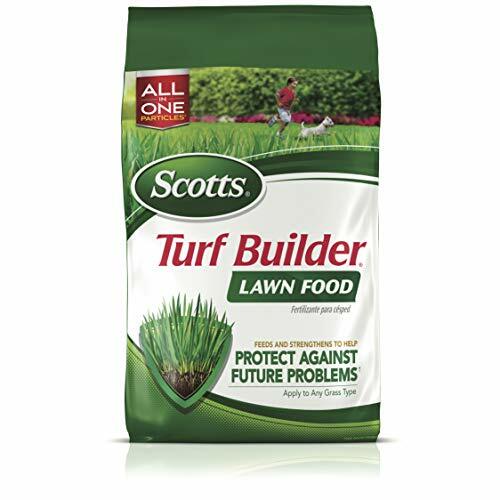 ​Scotts is a subdivision of the Scotts Miracle-Gro Company:; the biggest manufacturer of lawn and garden products in North America. These guys deal in everything, from tools, accessories, equipment, machines, plant food, soil amenders, and much more. They have more than 140 years of experience behind each and every one of their products, which is a testament to their standards of quality. As its name suggests, this product is meant to be used as a turf builder. In other words, it's food for your grass, rather than your plants. After a single use, your lawn will build bigger, stronger roots, which will improve its ability to absorb water and nutrients from the soil. In just a few weeks after the first use, you will have the greenest patch of grass you have ever seen. And the best part of all is that it’s completely pet-friendly; it's okay to let them frolic in your lawn immediately after the application, with no risks whatsoever. Most fertilizers are made up of 3 important nutrients; nitrogen, phosphorus, and potassium. These are important as they promote the health of the plants and help them grow big and strong. In the case of vegetable or fruit plants, fertilizers will also benefit their production, helping them to create bigger and juicier fruits and vegetables. For this reason, many gardeners opt out of using fertilizers on their gardens. Luckily, there exists a category dedicated to pet-friendly lawn fertilizers, so that you can have a beautiful garden of your own, while also keeping your beloved pets safe from harm. 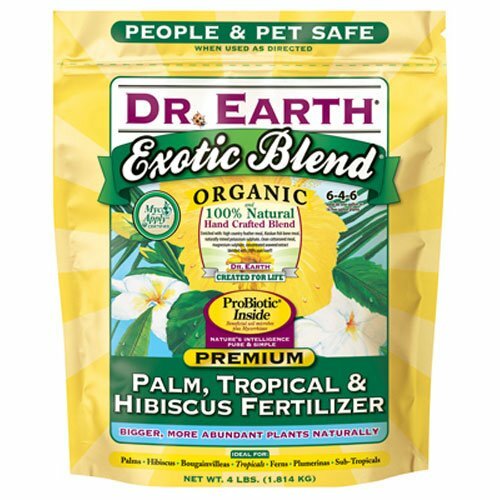 Below are our picks for the best pet-friendly fertilizers. Picking an appropriate fertilizer for your garden can be a challenging task, especially when we have to add the safety of our pets and children to the equation. Fertilizers that are both pet-friendly and of high quality can be difficult to find if you don’t know what you are looking for. In that sense, a good starting point would be to check user reviews and see for yourself if the product is truly safe for animals. And even if the package claims that it is, please remember to keep your fertilizers, andor other similar products, away from the reach of your pets and children. I have always kept from using fertilizer on my backyard lawn, for fear my dogs would perhaps get sick. Now I know I can use Scotts Turf Builder on my lawn!